December | 2010 | Small Farmers. Big Change. This article was reposted from the December 2010/January 2011 issue of The Exchange. 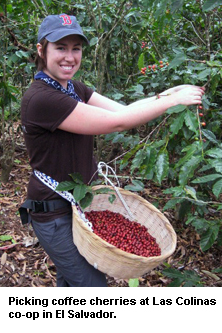 I just got back from a five-day trip to Las Colinas co-op in El Salvador. 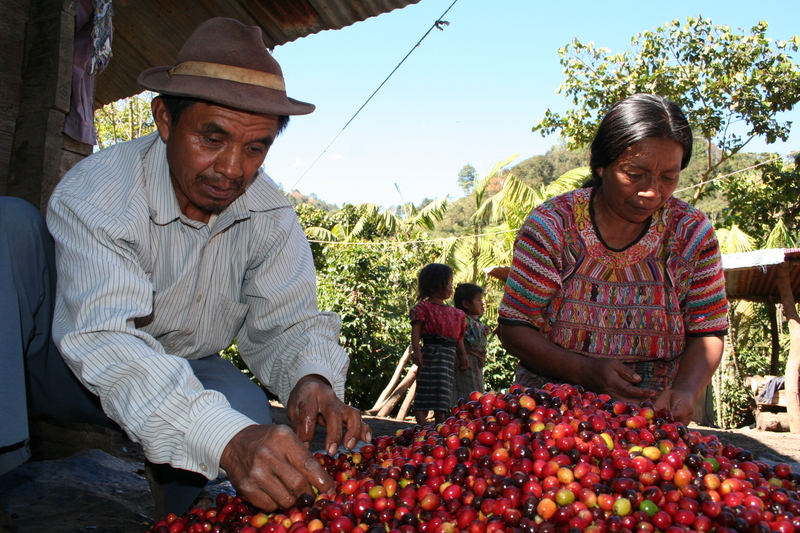 I was fortunate enough to tag along with our Quality Control Manager, Beth Ann Caspersen, as she implemented a new set of quality standards with the farmers at the start of their coffee harvesting season. Trips to visit producers are always special, and for different reasons. This trip happened to fall over Thanksgiving. 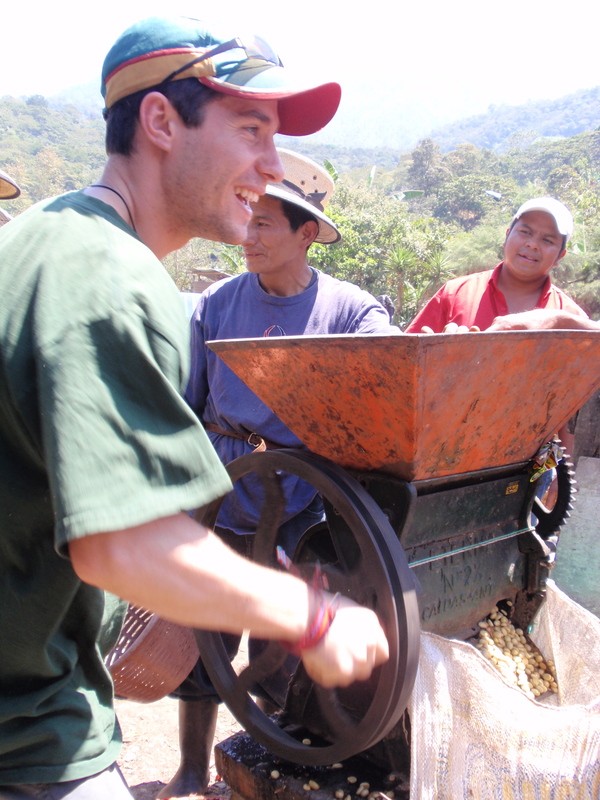 We spent Thanksgiving Day on the farm–or finca–harvesting coffee amongst the producers. They showed me how to best approach the tree: start from the bottom and work your way up. I filled my basket with red, ripe cherries, and a few not-so-ripe ones, which had to be sorted out. After a few hours I didn’t even fill one basket (the producers were much faster than me, and filled several baskets). I only would have made about 80 cents for my work. After the weigh station, we followed the coffee to the processing facility, which included a really cool set of de-pulpers that remove the skin from the coffee cherries and a desmucilinadora that removes the pulp from around the coffee beans and allows the producers to transport the coffee beans through a washing canal directly to the drying patio, where they soak up the hot winter sun. At the end of the day, Beth Ann and I shared a meal. Instead of turkey and mashed potatoes, we had chicken, rice, pupusas and plantains. Exhausted, we were in bed by 8 o’clock. And that’s the reality of life on the farm. It’s hard physical work. Equal Exchange has worked with Las Colinas for nearly 15 years. The relationship has grown even stronger the last few years, thanks in big part to work done by Beth Ann, as well as by our purchasing director, Todd Caspersen, who also happens to be Beth Ann’s husband. The producers will receive a higher price for meeting the new quality standards implemented during our trip, which obviously created excitement in the community. But I also saw something else: a renewed sense of pride in the farmers for the high quality coffee that is coming out of their community. “We are motivated by your presence here,” producers told us again and again. What I couldn’t quite tell them (my Spanish is limited) was that my presence in their community was motivating me, too, to get back to the U.S. and share their coffee and stories with the public. It wasn’t a traditional Thanksgiving Day by any means, but it was definitely the most memorable. The day got me thinking about things I’m thankful for, beyond the usual list. For instance, I am thankful to work at a company–and be an owner of a company–that is making a positive difference in communities like Las Colinas. I am also thankful for the network of people who choose to support Equal Exchange. Especially during the consumerism-driven holiday season, I hope we all remember that there are always people behind the products we buy– people like the ones I met at Las Colinas. For another story about Las Colinas, click here. End corporate control of food and agriculture! We received the following letter yesterday from our friends at Grassroots International. Please take a moment to read and take action. The aisles of most American grocery stores give an overwhelming illusion of choice. A closer look, however, quickly reveals that most of the meat, grain, milk — and even the grocery stores themselves — are all controlled by just a few corporations. This handful of giant corporations has grown so powerful that they not only dictate how our food is grown but also what farmers are paid and how much consumers are charged. What’s worse, these same corporations are exporting their industrial food model worldwide, grabbing up land from peasants and small producers who would otherwise farm it sustainably for survival. It’s time to change the equation. On December 8th, the Department of Justice is beginning a series of public hearings on the corporate control of food and agriculture in our country. Tell Attorney General Holder and USDA Secretary Vilsack to end corporate control of food and agriculture before the December 8th hearing. If you are tired of big food monopolies dictating what you pay in the grocery store, swallowing up small-scale and locally owned farms, risking your health and well-being with genetically engineered and poorly regulated foods, and threatening the sustainability of agriculture across the globe, then take action now! Thanks so much for supporting small farmers and helping to create a more green and just food system.